This is part two of a three part series. Read part one, part three. Visit our Admissions page below to learn more about how we can help you get accepted to dental school! We’ll continue evaluating our personal statement from last week and show you how to turn an average essay into an excellent one. We’ll be taking a look at the components in blue for part two. We continue our evaluation by analyzing the persuasive component of the personal statement. A personal statement should effectively persuade the reader to believe the author is an excellent applicant. This is done in part by conveying genuine intentions for joining the profession and future goals. Life experiences and personal anecdotes also play a role in creating a more persuasive personal statement. Avoid made-up anecdotes – these can be detected by the admissions committee and you may be asked specific questions about them. Demonstrating a basic knowledge of the profession also strengthens the persuasive component. It shows the admissions committee that the applicant has done their own research and has taken the initiative in their own education. 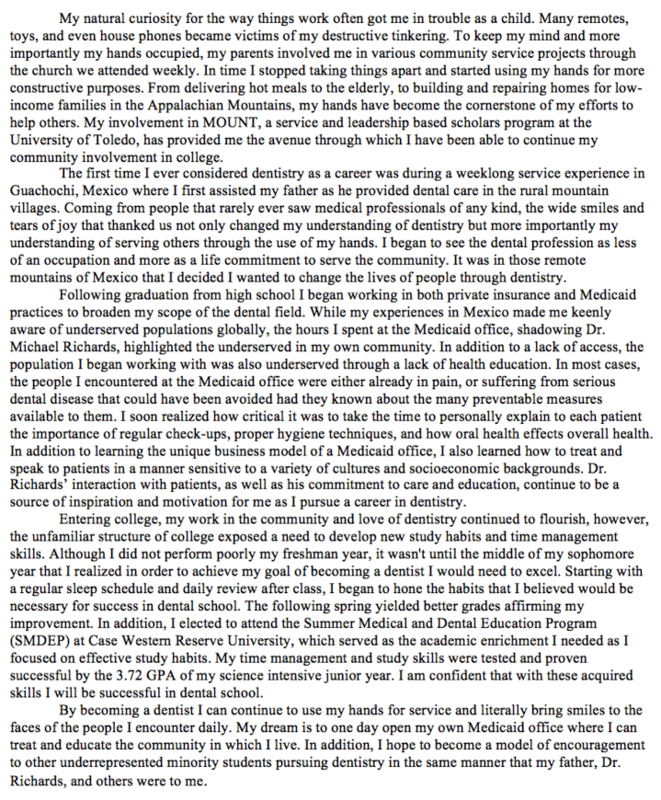 In the sample statement, the applicant demonstrates a basic understanding of the dental profession by providing shadowing experiences in which he actively participated. Content is an extremely important part of a personal statement. The content should give insight to the applicant’s background, decision-making process, and relevant life experiences. Providing an illogical decision-making process is a red flag that will make admissions committees question if the profession is a match to the applicant. It is important to provide information that is not just a summary of the application. This is the applicant’s opportunity to truly demonstrate to the admissions committee of who they are as a person. However, the content provided should stay on topic and contribute to the purpose of the statement. 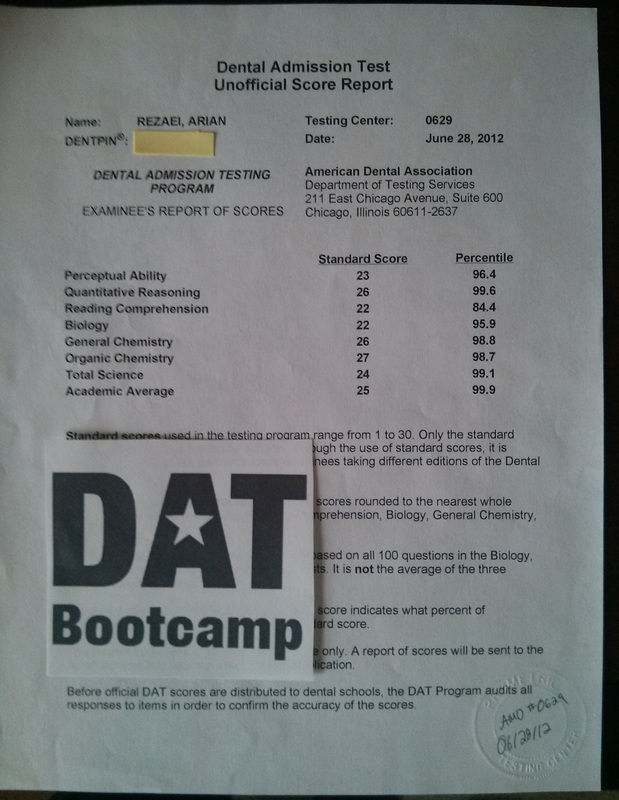 The applicant from the sample statement provides strong life experiences and provides insight to how he has decided that dentistry is best profession for him. However, there is also unnecessary information provided as well. An example of this is when the applicant mentions his involvement in the organization MOUNT. This can be cut from the statement so it does not distract the reader or raise questions that are not answered later on. A personal statement that conveys a strong passion for the profession will also increase the statement’s persuasion. The applicant can convey their passion through a personal statement by providing examples of how they continue to pursue the profession. This can be through continuing to shadow, volunteer at clinics, taking science courses, or through other activities that show a desire to become a dentist. A personal statement can be written in a unique manner or with a more traditional approach. This is up to the applicant on the approach that they wish to take. Having a very unique personal statement can either make you standout in a positive or negative way. However, as long as the key elements of a personal statement are included, a personal statement’s uniqueness can only help the applicant standout in a positive way. Lastly, we evaluate confidence. The applicant wants to convey a sense of confidence that the profession was thoroughly explored and now have come to the conclusion that it is the best match. This needs to be balanced so that the applicant does not come off as making assumptions about their acceptance.